Lymph node dissection (LND) may be performed either for staging or for therapy. This discussion is limited to the former. 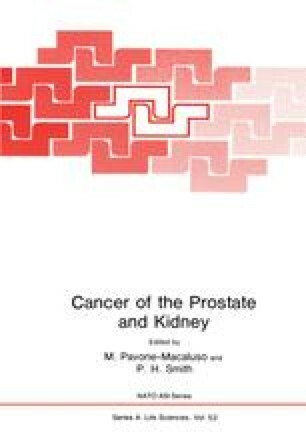 LND has added considerable data to our clinical knowledge of prostatic cancer. At present it is the most accurate method of assessing nodal status. Utilizing LND the incidence of lymph node metastases has been related to the following parameters amongst others: size of the prostate, histologic grade (1), extent of intracapsular disease, extent of contiguous extra-capsular spread, especially to the seminal vesicles, and over-all clinical stage. LND has demonstrated that a percentage of patients felt to have disease limited to the prostate by clinical staging, in fact, have cancer metastatic to the lymph nodes. This information has had a significant impact on our concept of the percentage of patients in each stage at presentation. Patients with alleged localized clinical stage A1 disease have a 2–5% chance of having positive lymph nodes. The figure for A2 disease is 3–54%, for B1 disease is 10–40%, for B2 disease 39–45%, for C disease 50–80%. A recent review of the world literature (1) clearly documents the strong influence that histologic grade exerts on the likelihood of positive nodes.